17 teams of student and graduate entrepreneurs presented their business ideas to over 50 judges to win a share of the £5,250 CitySpark prize fund. 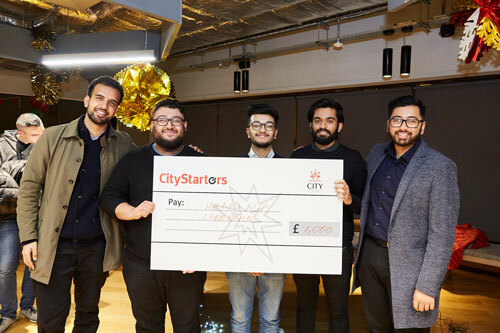 HandUp Learning, a start-up masterminded by City, University of London alumni has won CitySpark, City’s annual entrepreneurship competition. CitySpark is a business idea and venture creation competition that helps students and recent alumni to develop a business idea, test it out with potential customers and then make it happen. There were over 100 applications to CitySpark this year, with 17 finalists selected for the Marketplace Final, where they pitched their ideas to 50 judges including business founders, alumni entrepreneurs and staff from across the University. HandUp Learning will receive £1,000 towards developing their idea which is currently in the pre-alpha stage. Founded by City alumni Monwar Hussain (International Politics, 2016) with his friend Imran Ali, HandUp Learning is a cloud-learning platform which helps parents to support their child’s education more affordably. Monwar, who has been working on the idea for a year, said he was over the moon to win CitySpark and was very grateful for the support he had received so far. HandUp Learning is further supported by other City alumni including Saamer Shafique (Civil Engineering, 2015), Arif Islam (Law, 2017) and Shah Khan (International Politics, 2016). The Makers Spark prize of £1000, sponsored by the Engineers in Business Fellowship, was awarded to BubbleMind, an app for children with autism. The Green Sustainability prize of £1000, sponsored by the City Sustainability team, was awarded to The Little Bean Company, a social enterprise that imports ethically traded organic coffee from the Jamaican Blue Mountains. Two Runners-Up prizes of £750 each were awarded to MustRace, a platform that connects sport enthusiasts and race directors to allow users to easily find, compare and book endurance events, and Lonbrella, the first umbrella rental service in London that provides high quality and windproof umbrellas. The People’s Champion prize of £750, voted by the audience, was awarded to SkipEat, an app which eliminates waiting times and queues at food stands, while providing a payment system through the phone and so enabling food stands to accept cards without any external hardware. Alex Elkins is the Head of Entrepreneurship at City. He said CitySpark provided a unique experience for students and recent graduates to showcase their ideas and receive feedback on how to take their business to the next level. “We have had an exciting array of ideas this year, with our biggest prize fund ever. Competition for stalls has been fierce and it is fantastic to see so many new and innovative ideas being produced by City’s aspiring entrepreneurs. The BlackBox is a small device (currently in Alpha) that allows a user to use the internet indirectly, preventing hackers, businesses and other people from keeping an eye on their browsing history and internet usage. All they have to do is plug the BlackBox into their computer and connect it to their WiFi. No mess and no hassle and more importantly no sharing of their details and putting their device in harm's way. BiNow Ltd is introducing Sherlock the deal notifying ecosystems that notifies you with what you want for the price you want. This is done by accessing and scanning 24/7 retailer data to target advertise and deliver through notification, the right promotion, at the right time. BubbleMind is an app for children with autism. It helps them to calm down and can be used as an educational tool. It works by producing bright coloured bubbles and soothing sounds to make the user feel calm. eCityTruck is a digital platform that connects car manufacturers to drivers directly. The platform is designed to provide capacity aggregation, in other words, it optimises the truckload to make sure each truck is fully loaded when driving from one city to another. To achieve this the platform takes requests from multiple manufacturers located in proximity to reduce empty running mileage and drop freight rates up to 15%. FoodHive is an interactive platform, which recommends the perfect meal in your local area based on your preferences and budget. It allows users to search for “Meals” in their local pubs, restaurants, takeout spots and food street stalls as well as finding out what their local home cook is brewing. FoodHive therefore allows the users to find exactly what they want saving them time and the hassle to go through the bombardment of menus while also letting you explore Food. Not just that but you can share the amazing food your activity with your friends through your Hive. Gym Pump automates the manual process of using supplements and removes the hassle of planning and preparing it .The machine will be installed inside the gym for our consumer’s convenience and it will be very easy to use. You will have the different products displayed on the left side of the screen (Protein whey, Creatine, Pre-workout, etc.) and you will have the different mixing option (either water or milk). After selecting your choices you will have a fresh drink ready for you in less than a minute for a cheaper price! HandUp Learning is a cloud-learning platform that helps parents support their child's education better for the best value. Our platform allows children to independently complete learning activities at home while their parents can have an overview of their progress. Currently, parents struggle to support their child's education due to time and money. We give parents flexibility and affordable access. Jigsaw is developing a website to help part-time job seekers find and apply for work that fits their schedule. Part-time job seekers will be able to search jobs by the criteria most important to them, such as shift times, location and hours per week. The Little Bean Co. - A social enterprise that imports ethically traded organic coffee from the Jamaican Blue Mountains. We support economic independence and help to promote to environmentally conscious practices. Lonbrella will be the first umbrella rental service in London that provides high quality and windproof umbrellas. It offers convenience, affordability and reliability to people who need to commute to places despite the rain. MustRace is a platform that connects sport enthusiasts and race directors to allow users to easily find, compare and book endurance events. MustRace is the community for endurance enthusiasts. While MustRace aims to become the number one tool for sport enthusiasts to find their perfect event, it also serves the under represented Race Directors (RD) community. Nexos is a cloud-based platform solution for Retail businesses that allows the most efficient allocation of own workforce and additional required freelancers across multiple locations. It helps you to control and manage your workforce easily all within one system, without the need for multiple communication channels and complicated spreadsheet workflows. In addition, you will have access to freelancers from across Europe to serve even your most remote locations efficiently. R.E.A.P. - Renewable Energy Advancement Platform "Reap what you Sow". The first mobile micro-investment platform for small-scale renewable energy production and technologies in the UK. REAP brings together the ethically conscious of Society and Sustainable investments that benefit the planet as well the Banks. Whether you're looking to invest or save, whether you're trying to offset your ecological footprint or simply support a good cause - you REAP what you Sow. Shaanti focuses on supporting students grappling with mental health issues. Bridging the gap between counselling and mental health service provision through NHS, Shaanti aims to create a safe environment for students through affordable yoga classes that will concentrate on physical and mental wellness. Though promoting a sense of community, students will find support by coming together and sharing experiences without being judged while at the same time reach inner equilibrium through the practice of yoga and mindfulness. The aim of SkipEat is that of eliminating waiting times and queues at food stands, while providing a payment system through the phone and so enabling food stands to accept cards without any external hardware. The stands would also benefit from an interactive menu, smart analytics and a reviews and tips system. Sunmo Foods brings a loved crisps snack using handpicked plantain providing a strong vegan offering and we are the first crisps brand to focus on sustainable, 100% recycled and recyclable packaging in our snacks and bring it to market. Wearth London is an online department store for luxurious sustainable and ethical products, which launched at the end of October. Wearth is a new online community where people can find brands that have strong environmental and social values whilst creating a platform for these brands to increase their exposure and grow. Each brand delivers direct to the customer with Wearth taking a commission for the sale.